TUCSON, Ariz. Former Rep. Gabrielle Giffords returned to the scene of the horrific shooting that wounded her and killed six people two years ago, urging senators Wednesday to pass background checks for gun purchases in her first public event at the site since the rampage. "Be bold. Be courageous," Giffords said. "Please support background checks." At one point, Giffords pumped her fist in the air and grinned. Other survivors joined Giffords at the news conference, along with her husband, Mark Kelly. Giffords and Kelly have returned to the Safeway previously to visit the memorial, but Wednesday marked their first public event at the store since the shooting. Sheriff's deputies were there to provide security. A gun control group started by Giffords and Kelly, Americans for Responsible Solutions, began airing a new television ad in Arizona and Iowa Tuesday calling for background checks. 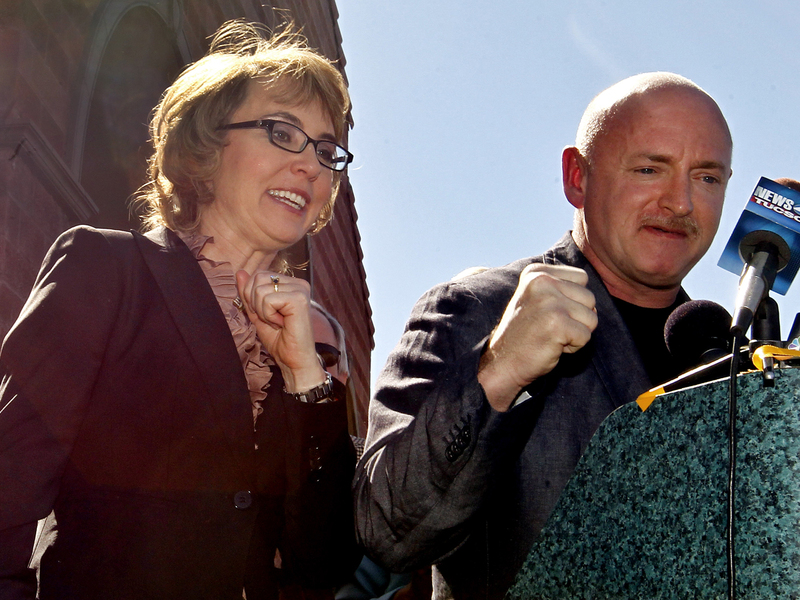 Giffords and Kelly support extending background checks to gun shows and Internet purchases. The Senate Judiciary Committee is scheduled to take up tougher firearm regulations Thursday. "This discussion is not really about the Second Amendment," Kelly said. "It's about public safety and keeping guns out of the hands of the dangerously mentally ill."
Kelly said he and his wife are themselves proud gun owners. Jared Lee Loughner, 24, was sentenced in November to seven consecutive life sentences, plus 140 years, in the Tucson shooting. The rampage happened at a meet-and-greet event organized by Giffords outside the grocery store on Jan. 8, 2011. Kelly said it was not difficult to return to the place where his wife nearly died. As he spoke, shoppers and vehicles moved throughout the ubiquitous shopping center that includes a nail salon, a Starbucks and dry cleaners. It smelled like grocery store fried chicken. It's places like this, Kelly said, that Congress needs to make safer. Supporters gave Giffords a standing ovation as she arrived at the event with her husband and staffers. With Kelly's help, Giffords walked directly to a memorial outside the supermarket honoring the victims of the shooting, where she placed a bouquet of white roses and daisies. Kelly, who was not present when the shooting occurred, recalled the massacre that took place two years ago on a chilly morning. Loughner walked toward Giffords and shot her once in the head before directing fire at the crowd around her. He released 33 bullets in 15 seconds, Kelly said. "It was clear that the shooter had a history of mental illness, but he had easy access to a gun," Kelly said. "If things were different, he would have failed that background check." Giffords resigned from Congress last year. Kelly, a former astronaut, has been by her side during her recovery. On Wednesday, Giffords occasionally rubbed her husband's back as he called for gun control reform and introduced the victims of the shooting. Many of the 13 wounded survivors underwent multiple surgeries and months of physical therapy. Susan Hileman described her excitement before the 2011 event as she waited to introduce her 9-year-old neighbor, aspiring politician Christina-Taylor Green, to Giffords. Green was the youngest of those killed. "I am tired of this," Hileman said. "If we can save one life, if we can keep one family from feeling this awful, empty ache, if we can do something, and if that something is a commonsense something, if that something is a responsible step ... then I wonder what the problem is, people?" Emily Notterman recalled that her son's bullet-ridden body was left on the sidewalk outside the supermarket for hours as investigators scrambled to make sense of the chaos. Her son, Gabe Zimmerman, Gifford's director of community outreach at the time, was 30 years old when he was shot. "It's very hard to be here today," Notterman said. "The system is riddled with holes  bullet holes. It needs to be fixed."